October 24, 2012 BG Meters, FunStacey D.
I am all about accessories. Handbags, wristlets, phone or tablet cases, meter cases. I’ve got quite the collection of these things. 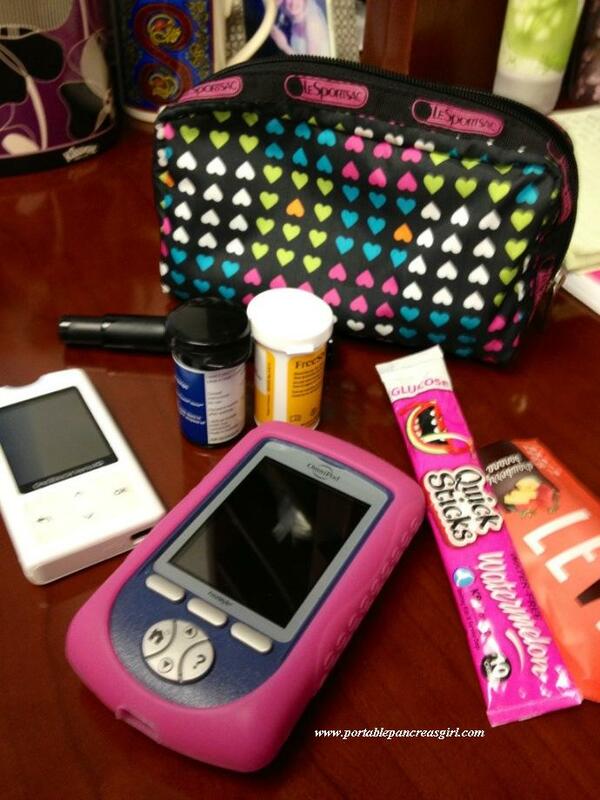 And lucky for me, diabetes gives me more devices that I can accessorize! After reading Kerri’s post today on her Diabetes Grab Bag, I decided to post my own to answer her question, what’s in your diabetes grab bag? Since I have an abundance of accessories for my BG meter devices, I do like to switch it up. I tend to get bored using the same thing day after day. My favorites are from Myabetic or Sugar Medical Supply or Stick Me Designs. (If you haven’t checked them out, they each have great stuff!) But lately I have thrown in a regular cosmetic case for use to carry my meter and supplies, like Kerri, Kim, Rachel, Alanna, to name a few. I like it because it’s compact yet big enough to hold all the things I need to test. Or treat a low. And keeps my meter or PDM handy instead of securing it within the case. I can even throw my Dexcom receiver in there when it’s not next to me. There is so much information in this post! I keep clicking links. I also have a second bag that lives in my purse with the emergency supplies, like extra pods, a syringe and some non-D girl emergency supplies. I feel like if it were fashionable enough I might just have a d-suitcase.